Staying in trend with technological innovations have made us a frontrunner in the industry. 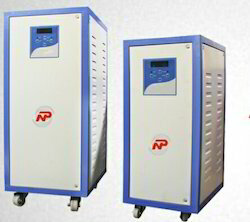 We are one of the best UPS Suppliers in Chennai and suppliers of a wide range of Servo Voltage Stabilizers offering quality products to meet your power needs. We have consistently strived to maintain high standards, and our products are tested on numerous quality parameters for delivering excellent power configurations without compromising on high standards of ethics. Behind our success is a contemporary infrastructure evolving with time helping us to carry out our business with confidence. We follow systematic workflow to improve operational efficiency at every stage. Outfitted with latest and advanced equipment, we are all geared to produce innovative and superior quality products. Our stabilisers are supported by guaranteed switchgear components to maintain the range in providing constant output voltage every time. Efficiently designed to deliver correct voltage by reducing power consumption giving scope to low electric bills. Our Servo Voltage Stabilizers are functional between 1KVA and 1000 KVA. We are proud to offer two types of stabilisers, air cooled and oil cooled versions with functional circuits to operate generator sets. These come with a motor-driven control mechanism for high performance and is capable of working in extreme conditions. What makes it incredible is its load balancing and voltage accuracy to meet any power factor offering savings on energy. The service warranty makes it an attractive option.